and rewards you with choice scholarships, life-changing international travel, and the tightest group of friends you’ll ever have. Imagine yourself a part of Bloomsburg University’s Honors Program. It’s designed for smart students like you who want the very best experience that an undergraduate education can offer: a rigorous, interdisciplinary curriculum, a cohort of creative and passionate peers, and the professional guidance and support to explore, create, learn, and succeed brilliantly. Learn more about the Honors experience. The Honors Program at Bloomsburg University provides exceptional opportunities for high-achieving and high-potential students like you to expand your cultural and personal boundaries while reaching your intellectual and career goals. A new anthropology program with an archaeology twist brought to Camp Victory this summer as part of its Nature Center activities, courtesy of this Husky’s honors research. Summer intern Anne Snyder — a triple major in anthropology, French and psychology — created a curriculum in conjunction with Susan Dauria, professor of anthropology, to teach children about local Native American Culture, history and archaeology. 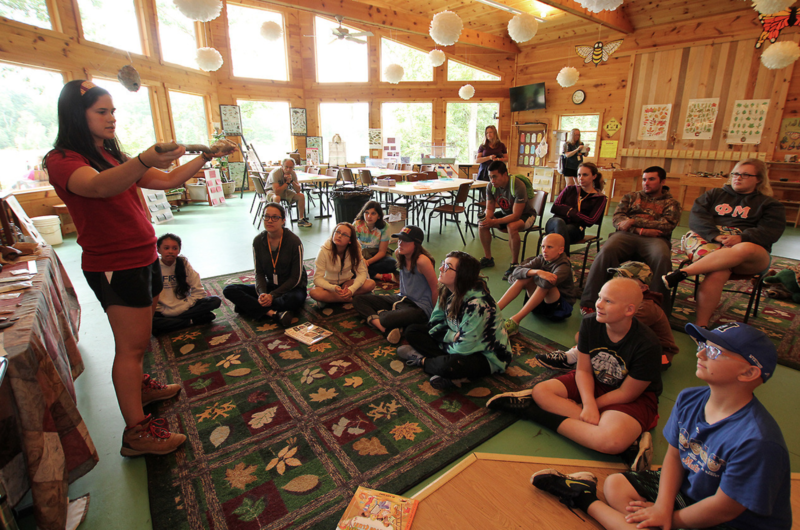 The new curriculum was utilized as part of Camp Victory’s Nature Center activities.